Gwaii Haanas National Park and Haida Heritage Site were established in 1988. It is a remote collection of 138 islands which stretch 90 km from north to south in the southern part of the Queen Charlotte Islands (Haida Gwaii). "The place of beauty" is the ancestral home of the Haida - the West Coast First Nations who have lived here for thousands of years. 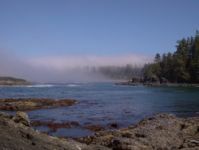 The untamed rugged beauty the rich ecology of the Pacific coast and the Haida’s more than ten thousand years of connectedness with the land and sea is an amazing and spirituell experience. The remains of SGang Gwaay (on Anthony Island), are the world's finest examples of Haida mortuary poles - all more than a hundred years old. It was declared a World Heritage Site by UNESCO in 1981.
for guided tours to white sandy beaches, pools of clear tepid water, rich fishing grounds and meandering rivers and estuaries. Gwaii Haanas is an extraordinary and very popular kayaking destination.